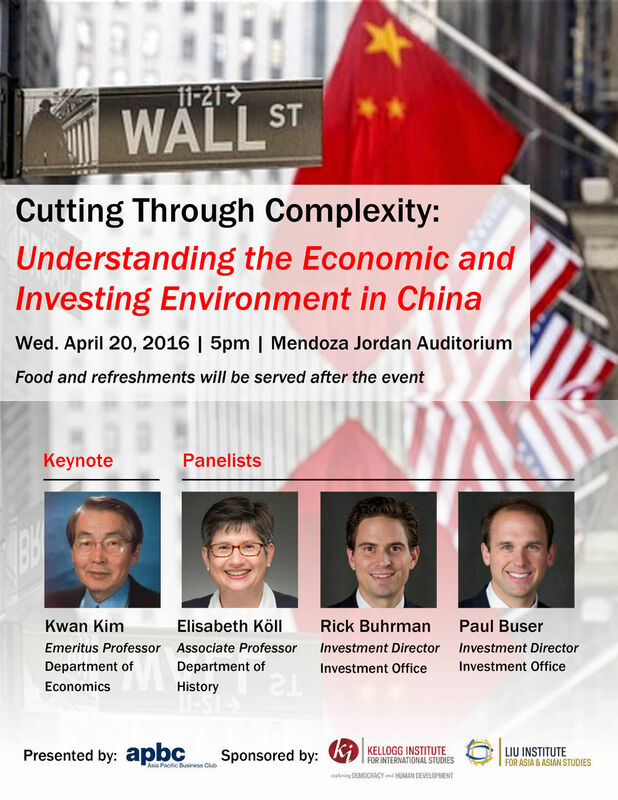 Asia Pacific Business Club (APBC) is excited to announce our last event for this semester—a panel discussion about The Economic and Investing Environment in China on Wednesday April 20, 5pm in Mendoza Jordan Auditorium! Professor Kwan Kim from the Department of Economics will be our keynote speaker, and our panelists include Professor Elisabeth Köll from the Department of History and two Investment Directors, Rick Buhrman and Paul Buser, from the Investment Office. A reception will also be provided. Professor Kwan Kim is an Emeritus Professor of Economics and a Faculty Fellow of the Kellogg Institute for International Studies and Liu Institute for Asia and Asian Studies at Notre Dame. Kim has published books and articles extensively in over fifty professional journals in the areas of development studies, international economics, and quantitative analysis. As an international development economist, he has also occasionally served as an economic consultant for governments and international agencies. Professor Elisabeth Köll is an Associate Professor at Notre Dame who specializes in Chinese socio-economic and business history. Köll pursued her undergraduate education at the University of Bonn in Germany and at Fudan University, Shanghai. She received her Ph.D. in Chinese Business History from Oxford University where she was a Rhodes Scholar. Prior to joining Notre Dame, she taught at Harvard Business School and Case Western Reserve University. Rick Buhrman graduated from Notre Dame in 2001 and earned his MBA at Harvard Business School in 2005. He joined the Investment Office in 2006 after a year of studies at Oxford as a Frederick Sheldon Fellow. Buhrman is currently an Investment Director at the Investment Office with investing experience in China. Paul Buser graduated from Notre Dame in 2003. After working at Boston Consulting Group for three years, he earned his MPA from Harvard University Kennedy School of Government and MBA from Harvard Business School. He joined the Investment Office in 2009 and is currently an Investment Director with investing experience in China.